You just NEVER know what's coming out of the kiln. Remember the clay a friend and our kids dug from the sandbars of the Mississippi river? How it turned to terra cotta when bisqued? 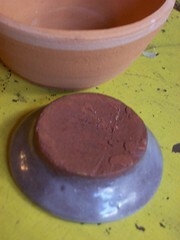 I was so disappointed to lose the rich deep brown of the native clay. At 2200 degrees, it almost came back. Still pretty reddish, but it held up (I had a small fear that it might melt in the kiln) and I'm pleased with the body color. The clear glaze is another story. I thought it looked milky. Gary though it looked bluish or plumish. "Physics just gets turned on its head at 2000 degrees," he surmised. I still have a bigger, fluted bowl in this clay and more to make another for the family that camped with us, but I'll have to solve the riddle of this milky not-clear glaze. The clear IS clear over underglazes or a white clay body, but there's no telling what minerals are in this raw clay and how they'll react with any given glaze. I have some other pieces to show you next week- my greens were deep and more jade-like than ever. This morning's 5k was good- so cool (about 65)- and I shaved almost 2 minutes off my time. No walking this time. I think if I'd had my iPod on, it would have been even better. Next time. Hope you're all having a happy weekend.